Well, today is Thanksgiving Day in America & even though we don't celebrate it here in South Africa, that doesn't mean I'm not thankful for so many things. Oddly enough, one of the ladies in my office asked me this afternoon when Thanksgiving was in America. I told her that I thought it was today & we got into a discussion about what a lovely idea for a holiday it is & how it's such a pity that we don't having anything like it here. We agreed that EVERYONE should take the time to give thanks, even if there isn't a specific holiday for it. So there & then, I got my idea for today's post. Obviously I'm thankful for my family & friends & all those great things, but that's not what this post is about. This is a Twilight-type blog, after all. I am thankful for all the wonderful people I have "met" through my enjoyment of Twilight Fan Fiction, especially the lovely Stephanie (cullen818), since I wouldn't even be involved in any of this, if it wasn't for her & her exceptional stories. I am thankful for Stephenie Meyer, since she decided to put her dream to paper & all these wonderful characters originated in her mind. 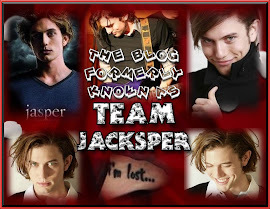 I am thankful for the deliciousness that is Jackson Rathbone & his portrayal of the hugely under-appreciated Jasper Whitlock Hale (I wouldn't know who he was if he didn't get that part & that would be a travesty). I am SO grateful for Fan Fiction & the marvelous ladies who write Jasper stories, since the original books & movies did him a major (excuse the pun) disservice. I am thankful for the fact that there are people who actually like my little blog & take the time to come & look at it. It makes me ridiculously happy every time I get a comment on a post or a new follower. =P Totes makes my day! And I am REALLY thankful for my internet connection, that allows me to do all of this from the other side of the world. Without it, I would be lost. And I am thankful that I FINALLY get to see New Moon tomorrow, since it is officially opening here in SA. YAY ME! As if all of that wasn't enough, 100 Monkeys have released another video on YouTube. The song is called Sleeping Giants & it is awesome! Enjoy! Happy Thanksgiving to all who are celebrating it. May you have a blessed day.